A few months ago, I drove to L.A., paid for parking in one of those Little Tokyo parking labyrinths, and waited for over an hour to get a seat at Daikokuya, a highly-regarded L.A. ramen shop -- all for a bowl of noodles that would've disappointed me if I had only waited a minute. After their first slurp, my friends -- Daikokuya devotees who had convinced me to meet them there -- also admitted that it wasn't as good as they remembered. We thought of a myriad of excuses for it. An off-night? An absent chef? Ultimately, I decided that the commute was too ugly for another go round. But despite that lackluster bowl, I was hopeful when I heard that Daikokuya was unveiling a branch in O.C. With its soft opening a few weeks ago, it makes Costa Mesa -- a city that already has Santoka and others -- the ramen Mecca of Orange County. At first glance, the new O.C. store bears no resemblance to the original. For now, there is no wait. At their stall in the Marukai food court -- where the typical lunch crowd barely constitutes more than a trickle -- I was the only customer. An abbreviated menu sampling was scribbled on a chalkboard no bigger than a sheet of copy paper. It was a warm-up list of the basics, which my Latina cashier (who greeted me in Japanese) said were the only items available at the moment. There was one ramen, gyoza, a rice bowl topped with shredded pork, and a combo of the three. The ramen ($8.50) came in a trough big enough to immerse your entire face in. 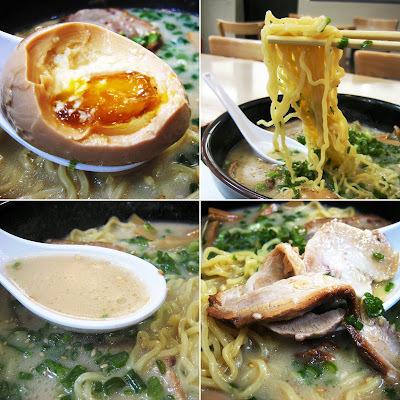 The required components were all present; slices of pork, a whole egg, bamboo shoots, the noodles, and the broth. But as soon as I took my first sip, it felt like a repeat of that first experience. The milky-brown, caramel soup was luke-warm when it should've been boiling hot -- and the flavor was muffled when it should've been bold. My palate could still make out the words and hear the melody of pork, salt, and sweetness; but it wasn't enough to make it dance. What my mouth got instead was a merciless beating by green onions. Gobs of it overwhelmed every spoonful, interfered each slurp and fouled up my breath for no good reason. 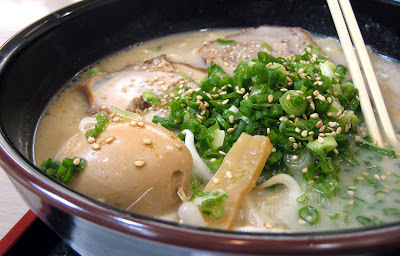 Without the support of the broth and because of the persistence of the scallions, the subtleties of the noodles slid further into the background. The pork slices, on the other hand, were blubbery things. They were braised so long, they couldn't be lifted out of the broth without disintegrating. Fatty and unctuous, it's what I enjoyed most in the bowl. Then I encountered the egg. As I bit off a chunk, I uncovered a raw yolk surrounded by a still-clear albumen. This, I did not expect. I have marveled other ramens featuring eggs with yolks that were just barely set; but never raw and bleeding. I pushed it aside, and made sure it didn't tip over to muck up the broth. So I'm back where I started with Daikokuya. However, since this is just their soft-opening, rather than being incredulous, I am still hopeful. Plus, because it's in the neighborhood, it will be easier to give them another shot to be great. Here's hoping they can. To read what a Daikokuya visit should be like, read Wandering Chopstick's post on it, HERE. Last time I was there they weren't open. I heard a couple talking about the L.A. location and my ears perked up. I'm glad I wasn't on a mission to get over there. Hopefully they pull it together and live up to the rep they seem to have. Elmo, its good to see you post a negative review every now and then to warn us of impeding doom. Sorry about your ramen experience and there just doest seem to be that many good ramen places in OC. On a side note, I went to 2 places becaue of this blog. Stonefire grill. I ordered the same pizza. I didnt really like the pizza, but thats only because I dont think I like pesto on my pizza. I need tomato sauce! I will simply order a different kind of pizza next time. I got their Southwestern Salad (small) and this thing was so good. And their portions are HUGE. What really impressed me was how friendly they all were there. They wanted to make sure I was enjoying myself and kept sharing their own favorites. Really nice people. I also tried Manilla's breakfast. YUK! Totally expensive for what it is and the sausage as pink, overly sweet and greasy and full of "chunks". Fried rice was so plain and boring. Eggs are from a steam table pan and not made to order. One of the worst breakfasts I had ever had. Had to you mess up breakfast? It was Asstastic. My sis and I were debating on trying the Daikokuya since it was open when we went today, but I guess it was a good choice that we went next door to Korean Kitchen. Your description of the ramen did not sound pleasing at all. If I saw the egg like that, I probably would have hurled. Maybe in a few months we'll give it a try when they get their act together. Good to know. I love noodles so I will venture down there to at least give it a try. I had ramen at this little place I think in the same plaza as Manpuku in Costa Mesa. I thought the noodle soup is pretty good. Elmo, there is a new Szechuan restaurant in Lake Forest (at the corner of Trabuco and El Toro) - I think it called Chong King. They have a lot of exotic Szuchuan dishes -- e.g., Chongqing Spicy Deep-Fried Chicken (重庆辣子鸡), hot pot (四川火锅), cold spicy beef (夫妻肺片). Very authentic taste. someone needs to tell me what the appeal of Ramen is and why it deserves to be so expensive. I hope they improve otherwise there is always the other shop right next door with there bold spicy ramen and not to mention salty too. I'm really pulling for them. Santoka is great and all, but every Disney needs a Warner Bros. Daikokuya already has the name recognition, it just has to earn it. I'm hoping for an impending success with Daikokuya. Like I wrote to Deb above, Santoka needs a sparring partner! I'm glad you liked Stonefire Grill. They impressed me too. However, regarding your comment about the Filipino breakfast: Have you tried longanisa before? You described what a good longanisa should taste like to a tee. In fact, I've actually been complaining in private to my good friend and Monster Munching reader named Cecile (who frequents Chowking in Cerritos like I do) that their longanisa is becoming more like a hot dog, absent of the "chunks" of fat and chewy things. A good longanisa will have a coarse, homemade texture. And always; it will be sweet and very fatty. To eat one, you *HAVE* to douse it with vinegar (Manila Groove provides it in glass bottles with a Thai chili floating in it). This cuts through the richness. Check out the Martin Purefoods brand of longanisa at 99 Ranch. They're considered the best. The point you made about MG's fried rice is true, however. MG does yellow rice. In fact, normally sinanag (Filipino Garlic Fried Rice) consists of white rice, salt, and toasted garlic. Nothing more. I would've preferred traditional sinanag than that yellow rice. Also it's a bummer that your eggs were plucked from the steam tray. Mine, on the other hand, were cooked to order. Perhaps because we came in late, they ran out and had to make more on the fly. Lucky us! That egg soured me on the whole bowl. Up until then, I was going to be very forgiving. Ah yes, Kohryu. I liked that place. But argh, I forgot what I liked about it. I guess I'll have to read my blog about it. I wrote thsy post a few month ago. That sounds awesome. I'll have to look it up. There are some ramens that are worth the price (like Santoka), but yes, when compared to pho for a fraction of the cost, it seems exorbitant. I'm no economist, but if I had to guess, it's because Japan is an expensive country and Vietnam is not? Hmm...where's my econ professor when you need him? Yeah, the pressure is on. And thanks! I had no idea Korean Kitchen had ramen! I'm always uneasy about runny eggs at restaurants too. I don't mind a runny yolk, but when the whites aren't set, I usually avoid them. Oh man, sorry to hear your experience was bad. I haven't been there since around Christmas time? I'm not sure when your visit occurred. I have heard rumors of watered down broth, even though they say they don't do it. Or maybe they're not simmering the bones as long as they used to? Speaking of Santoka, I tried the LA location and it was a huge disappointment. Not nearly as good as the Costa Mesa location. So I guess you just never know. Darn, sorry about that MM I thought you were at Mitsuwa on Bristol. Sorry for the confusion. I wasn't impress with the chicken teriyaki at this place if it I recall. It use to be that loco moco joint that I can't recall but it was a disappoint joint too. I'm sorry to hear another ramen shop go down the drain; or in this case, start off down in the drain. Anyways, at least the food looked appetizing when you first got it. At least to me it does, the first picture I mean. Same here. Runny yolks, I'll eat. Runny whites, I'll run away. Honestly can't remember when it was exactly that I went to Little Tokyo. I do remember there was a festival going on outside where the closed off the street and people were dancing in formation. That actually passed the time for me as I waited. I'm sure that I caught them on an off-night. A place that crowded can't survive if it disappointed people all the time. Ah! OK. Thanks for clarifying. But yes, Daikokuya took over the space vacated by L&L Hawaiian. I kinda went and did a ramen dissection with that last pic didn't I? Not too appetizing with my bite mark and all. HAHA! I circled their stand dubiously a few times when I was shopping at Marukai this weekend, but I've had notoriously bad luck with soft openings in the past. Thanks for taking one for the team. Hey Elmo - I made a trip up to OC before we left on vacation, but Daikokuya wasn't opened yet.....thanks for the heads up. I think I'll wait until the kinks get worked out. Do you like Japanese foods and fashion? If you are interested in Japan, there is a link to my site please. Japanese culture (for example, Japanese healty food, animation, games) here. Hey Elmo. Your description reminds me of my trip to Little Tokyo in LA. I've found the Chashu ridiculously soft but at the same time the soup stock lacking in bold flavors. It does not make my top 5 of ramen places, with Santouka being my #1. The Santouka in Torrance and Costa are about the same in quality and taste. I wonder if the costa branch has side dishes like the LA one did. the spicy fried tuna was actually really good. You were right to wait it out. Daikokuya has some tweaking to do. I would almost say don't bother with Daikokuya if you're only coming up for that. You've got so many great ramen places down in SD already! I tried one Tajima a few weeks ago...awesome. I do like Japanese culture! It's too bad I can't read Japanese though. Well, this is sad news. Since it's unlikely that you went to the LA Daikokuya the same night I did, the conclusion I have to come to is that LA's Daikokuya is lackluster more times than it is good. Is there hope for this branch? Not sure anymore. And for now, this Daikokuya doesn't have more than ramen, gyoza, and the shredded pork rice. Time will tell if it decides to expand to more items. Spicy fried tuna *DOES* sound awesome. went yesterday. thought i'd gamble since i had already read this post. maybe they read monster munching, or maybe they were off that day. my meal was very good. the soup was rich and substantial, the green onions not overpowering and most importantly, the egg was not runny, but just set - although i did find a couple of pieces of shell in my mouth after taking a bite. overall, the bowl was hot and tasty. i also had the gyoza, which were very good. give them a second try, perhaps. i'm just waiting for a more extensive menu. WOOO HOO! Thanks for the update. Whether they heard my pleas or not, I'm glad that it sounds they're doing something right (soup flavorful and hot, egg not raw)...now if someone over there can figure out how to peel an egg without including pieces of shell. But progress is progress. Wow, I guess Daikokuya has work cut out for them. I usually like Santouka myself, but having Daikokuya spread out to OC is a good thing and I'm glad they are taking it seriously. Too bad they didn't do it up to your standard. I hope they pick it soon or it is going to be overrated like Asa Ramen. How funny. I'm not the only one who wasn't too big on Daikokuya. $8 on bowl of basic ramen!!!! I thought ramen supposedly one of those dish that enjoyed by blue collar people in Japan. It seems that the place may be getting better as we speak. But damn this hot weather...I don't feel like eating ramen now. It's definitely on the expensive end of the spectrum here though, isn't it? I don't think I can afford to eat ramen very often in Japan if it costs as much as it does here! e - the reviews on yelp indicate that it is better than what your first visit indicated. but I haven't tried it yet personally. the egg was the best part!!! I was wondering when someone might chime in to say that the egg was supposed to be that way. But the whites were still clear and runny. Surely that can't be right? Anyone know what this style of cooking an egg is called? elmomonster, the egg is supposed to be hanjuku style, though I haven't seen it called by name in the Daikokuya web site or menu. Kohryu down the street has a much better version. It sounds like they didn't boil the egg quite long enough. The yolk should be almost jello like but it shouldn't be runny like the way you described. I didn't have very good luck at the soft opening either. I hope they shape up. OC could use a good ramenya! Oops. For some reason I completely missed replying to your comment. I wanted to tell you that I rushed over to Yelp to read the recent reviews on Daikokuya, and you're right! Sounds like they're shaping up! But I think I'm like you...we are Santoka loyalists! Oh, I'd love it if the texture was like you described -- when the yolk is like Jell-O. They definitely undercooked my egg. Yolks should never be raw (unless it's supposed to pierced over hot, steaming rice). Tried this place last saturday (7/5/08) and I could not agree more with your assessment of the ramen. The broth just lacked boldness and the ramen itself was pretty bland. The egg i got was ok, no undercooked yolk. I had to dispose more than half of the ramen, such a waste. Looks like the only decent ramen fix near me is the Mitsuwa food court. If you ever travel to Tokyo, try kyushu jangara ramen.